A Little History of Economics is a fast-paced, rollicking ride into the evolution of economics from the Grecian city states to behavioural and development economics that exists today. We get to meet all the famous names in economics like Adam Smith, Karl Marx, John Nash, Amartya Sen amongst others. During this journey, we get to learn about capitalism, communism, microeconomics, macroeconomics, Keynesian theories and Friedman’s rebuttal. Don’t get me wrong. Even though this sounds like an economics textbook, it is not. It is in fact similar to a historical fiction (almost a thriller of sorts). The underlying refrain throughout the book is to keep a cool head but have a warm heart (a quote by Alfred Marshall). The author, an economist, knows of the common impression that economists are considered out of touch of reality. This refrain, along with his focus on people, ensures that we get to see how policies affect the populace across the world. This is a book that focuses on the developing world too, in addition to the West (which most economics books focus on). 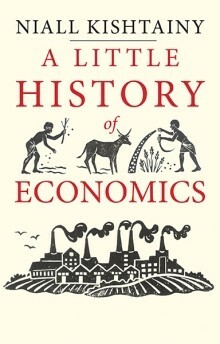 ‘A Little History of Economics’ is enthralling and is a rollicking read. We get a good exposure to economics without getting too caught up in the details. I think I learnt more about macroeconomics from this book than I did from the texts I used in college. Since I read an ARC, there were no graphs or charts. I felt that there were many places where the judicious addition of visual material would have added a lot to the understanding. I would have also like to a see a timeline with the evolution of economics.